CHICAGO – Rarely has an action game given me the same sense of accomplishment as “Deus Ex: Human Revolution.” While we’ve come a long way in the genre over the last few years, most shooters are still based on predetermined patterns. Enemies pop up in the same place. The same doors must be opened. Precise paths must be taken. Combining honest problem-solving along with what at least feels like choice is the kind of game development we only see a few times a year in acclaimed titles like “Mass Effect 2” or “Red Dead Redemption.” In these games, it feels like your experience is your own, not the same as anyone else on your friend’s list. “Deus Ex: Human Revolution” can join that elite club. It’s an amazing, challenging, and, most importantly, rewarding game. It’s 2027. Detroit. As you might imagine, it’s not a very good time. You are Adam Jensen, a security expert working for Sarif Industries, a D-town-based biotechnology company involved in some shady dealings. On the eve of some very important hearings, your top scientists are attacked and murdered and you are left for dead. The company you work for implants augmentations in your system that not only save your life but make you into something a little more than human. To get the bottom of the attack you’ll have to make a neverending string of decisions regarding new augmentations, weapons, and even if you want to se either of them or merely sneak by unseen. and continued throughout the game…adding an amazing sense of player screenwriting to the story) and was turned away. So, what do you do if you can’t get past the front door? I first ventured into the Detroit sewers and found a fire escape that took me to a roof entrance. Guess what? Sneaking into a place armed with future Robocops and being tasked with getting to the basement? Easier said than done. Although I’m sure some could pull it off with the right stealth maneuvers. I gave up. I went and did a few side missions and raised my ability to hack and found another way in. Right there, my experience was uniquely my own (and pretty frustrating). Hours later, when I was shooting it out with a boss battle in a Detroit basement, I honestly felt like I alone had crafted my path to get there. This is what I want from gaming. I want my involvement to be more than merely guiding my avatar from point A to point B. 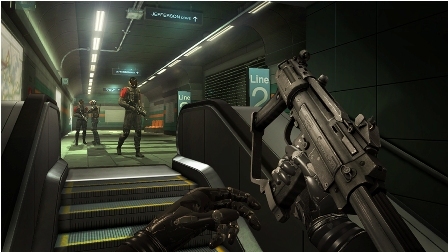 “Deus Ex: Human Revolution” provides that more than any other title so far in 2011. The authorship of “Deus Ex: Human Revolution” comes down to not just major decisions like conversational ones that will get you kicked out of the police station lobby but to the fact that how you handle a situation can be uniquely their own. Unlike a lot of stealth-based games, having your cover blown will not merely reset you to point A to try again. Sometimes you will have to shoot your way out. Sometimes you’ll have to run. One of the most remarkable elements of “Human Revolution” is in how the developers allow the game to play out. You will make mistakes. And you’ll often die and get sent back a few minutes as we’ve become so accustomed to in the world of gaming. But you’ll just as often merely have to adjust. Change your strategy. Move forward. Run. Make a split decision to crack someone in the jaw instead of killing them. Run again. Not only is the gameplay of “Human Revolution” simply riveting in its development but the game looks stunning. Cut scenes in which you perform takedown moves never get boring. And the art direction of the game — a color palette of browns and golds — is stunning. The voice work, the graphics, the overall aesthetic of the experience go a long way to keeping the player connected to the story. It all plays a role from the dialogue choices in long cut-scenes to the small things like the chit-chat between guards as you decide if you’re going to sneak by or shoot them in the head — great games are great in the details and “Deus Ex: Human Revolution” is a great game. “Deus Ex: Human Revolution” is a game about people being forced into situations where they have no choice that gives more to the actual player than nearly any other title this year. It’s about a lack of control but it’s presented in a style where you author the gaming experience. The story is much stronger than average (although a few side missions fall somewhat flat), the settings are always interesting and varied (at one point, after leaving my apartment, I decided to hack my way into a neighbor’s only to find a back room that was rigged with a bomb), and the action is incredible. And TOUGH. “Deus Ex” is not an easy game. You can’t take many shots and stealth or merely fleeing are often your best option. You simply don’t have enough ammo to defeat all of your enemies. And, unlike a lot of shooters, two to three shots removed from the excellent cover system and you’re done. It can be frustrating but the frustration leads to something too rare in the world of video games — honest satisfaction. Is “Human Revolution” perfect? Some of the cover maneuvers — going from one spot to another — can produce some odd camera tricks. There are some glitches like seeing guns through walls and enemies who merely stare off into the distance. Some of the character animations in cut scenes look a little ghost-like. These are all MINOR complaints. I wish I could say that the game was absolutely perfect but it’s close enough that I honestly don’t care about the little things. And there are no big things wrong with “Deus Ex: Human Revolution.” Not one. It’s been too long since I’ve been able to say that about a game. Don’t miss this one. 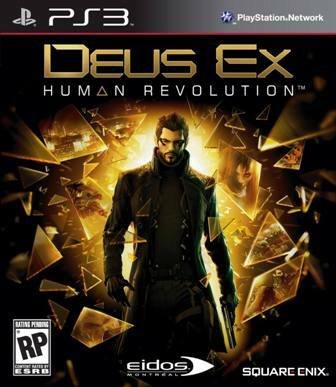 ‘Deus Ex: Human Revolution’ was released by Square Enix and developed by Eidos Montreal. It is rated M (Mature). The game is available for the Xbox 360, PC, and the version reviewed was for the PS3. It was released on August 23rd, 2011.